Is it truly a “seamless system” if it takes a user seven steps to find what input they need? Until the control interface is as sleek as the hardware behind it, there’s a big disconnect. Provide one-touch, direct access to all those AV smarts with the new generation of touch control options. Here are 13 notable and new offerings from manufacturers large and small. 1) FEEL MORE SECURE WITH YOUR TOUCH SOLUTION. THE WHY: Already used widely across enterprise applications, the TSW series gets an update with new touch screens that are even faster, more powerful, and secure. Getting a boost from a Crestron processor that delivers a whole new level of performance, the new models leveraged existing corporate protocols for security, including 802.1X, TLS, FIPS-140-2, SSH, and SFTP. And now delivering a seamless and satisfying meeting room experience is easier than ever with a built-in PinPoint beacon that enables contextual room booking based on availability, size, location, and purpose. Then when users enter the room, they can instantly connect to AirMedia for wireless presentation. 2) MIX AND MATCH AV SYSTEM CONTROL. THE WHY: Extron’s eBUS button panels are customizable, integration-friendly AV system control interfaces designed for use with Extron IPCP Pro control processors. eBUS button panels come in standard form factors and multiple units may be linked together by a single cable that carries both power and communication. Since they have the same physical appearance as Extron’s broad range of MediaLink controllers, eBUS button panels can be used alongside them throughout a facility while preserving a consistent look and user experience. Buttons can be easily customized using Extron Button Label Generator software or by using the online Custom Button Builder application. 3) CLOUD-READY, DISTRIBUTED ARCHITECTURE MEANS SCALABILITY. THE WHY: Slated for release in early 2017, Kramer Control’s distributed architecture and extensive cloud leveraging translates to agility and scalability. Catering to a single room or large global enterprise with the same ease of use, Kramer Control also includes an optional Analytics Dashboard (powered by Kramer Network), which automatically gathers all control data and generates actionable reports on device health and performance, room usage, operational efficiency, energy usage, and more. The Kramer Control Platform provides options for public, private or hybrid cloud implementation. A Manager module is used for defining project content and scope, and the Builder module lets users create, edit and configure room control systems from anywhere in the world. 4) PLATFORM-AGNOSTIC AND TOTALLY AUTOMATIC FOR THE PRESENTER. THE WHY: The QXT-700 is a platform-agnostic Quad Core IP HD 7-inch touch panel (QXT-700TS) and control system (QXT-2). Designed to mount into a standard two-gang box, the QXT-700 features a 1280 x 800 touch screen with 170-degree viewing. A 2D and 3D graphics engine with 1080p H.264 streaming decoder provides a powerful solution for complex graphics and video, ensuring an enhanced user experience. The QXT-700 also comes equipped with stereo speakers, stereo digital microphones, light sensor, proximity sensor, and IR Learner. 5) CONTROL AND CONNECTIVITY THAT WILL MAKE THE ARCHITECT HAPPY. THE WHY: Now you can fold a touch panel into the table, saving space and eliminating clutter, with the AMX HydraPort Touch. 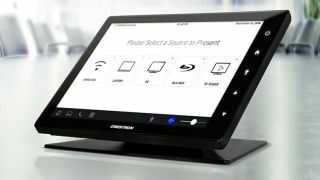 Integrating a HydraPort chassis with an ultra-slim 10-inch or 7-inch Modero S Touch Panel, the HydraPort Touch provides an efficient way to connect and control devices in rooms with limited table space. When closed, the unit sits flush with the table top, and a spring-assisted hinge assures smooth opening and closing, every time. Add features and functions by connecting any of a range of HydraPort retractable, power outlet and source selection solutions, including the HydraPort MyTurn Source Selectors, and USB 3.0 or 4K60 HDMI, DisplayPort, and Mini DisplayPort connectors. 6) SET THE SCENE WITH A SINGLE VOICE COMMAND. THE WHY: Control4 has announced integration with Amazon Alexa and Alexa-enabled devices including Echo, Echo Dot, Amazon Tap, and Amazon Fire TV. The Control4 Smart-Home Skill allows homeowners to use voice commands to generate whole-home automation through activating smart home scenes or controlling individual devices. A single voice command can initiate an automated sequence of functions, with support for nearly 10,000 popular lighting, audio, video, security, and comfort products. The new Alexa skill is included with a Control4 4Sight subscription, and requires an Alexa-enabled device. THE WHY: A self-contained control system, the Flex-LT’s 3.5-inch diagonal LCD touch screen mounts in a wall or sits on a desk and presents the user with an easy-to-use and understand color touch screen. A built-in scheduler enables automatic shut-off for displays when the room is not in use and dispatching of alerts to support staff on metrics such as lamp life. FSR’s Flex-Able configuration utility features drag-and-drop programming methodology and offers IR libraries. If a library is not available, the Flex-IR learner is a snap to use. Serial libraries are also available or can be entered in either ASCII or Hex. Serial and IR ports come standard, with an IP port on select models. The Flex-LT also features a built-in scheduler, multi-command scripting conditionality and PoE capability on models with an ethernet port. 8) CONNECT WITH CONTENT ANYWHERE. THE WHY: Elo now provides cellular connectivity options on its Android-based I-Series line of digital touchscreen solutions. New 10-, 15-, and 22-inch display sizes are available with an embedded cellular modem and SIM card in addition to the current Wi-Fi/Ethernet versions. The addition of cellular on the I-Series will allow dynamic content and interactive experiences where access to other networks is difficult. Two cellular connectivity options are available out of the box—Vodafone for Europe and AT&T for the U.S. market. Customers can choose other carriers through a Bring Your Own Carrier option. Capacitive multi-touch technology and a high performance Qualcomm Snapdragon quad-core processor deliver smooth and highly responsive multi-user interaction. 9) COLLABORATION READY AND CLOUD-MANAGED. THE WHY: Aveo’s Mira Connect is a tabletop touchscreen collaboration control appliance for managing conference rooms, offices, huddle spaces, and the equipment in those rooms. With intuitive operation and no programming required, Mira Connect can provide a consistent user experience for every collaboration room in a facility. Mira Connect uses an enterprise-grade cloud management system, Mira Portal, for easy deployment and conferencing system management, including generating notifications about room and equipment status. Mira Connect’s professionally designed interface allows users to easily launch audio and video calls, share content, and control audio levels in the room. Users can start calls through the room’s scheduled meetings, their company’s directory, via speed dial, or direct dial. Mira Connect currently operates with Polycom and Cisco audio and video conferencing devices, with support for additional systems planned in the future. 10) THESE ARE THE PERIPHERALS YOU’RE LOOKING FOR. THE WHY: The QSC TSC-7t is a PoE 7-inch touchscreen dialer and controller, providing full control over an entire Q-SYS system, VoIP audio conferencing, as well as a myriad of third-party devices in boardrooms and meeting rooms like projectors, lighting, and more. In addition, this Q-SYS peripheral features a micro USB port that acts as a tabletop AV bridging endpoint for the Q-SYS platform, giving meeting participants a BYOD access point to interface Q-SYS IP-PTZ conferencing camera feeds and Q-SYS audio processing with soft codec conferencing applications like Skype for Business, GoToMeeting, and more. Its user control interface can be entirely customized from within the Q-SYS Designer Software. THE WHY: The TSC-7C-POE-WM is a 7-inch 1024 x 600 capacitive touch screen control surface for use with the High Resolution Systems Enterprise Control and Automation Platform. Designed for in-wall mounting with included kit, the touch screen features an Android OS and integrated PoE to allow for single-cable operation and easy installation. Customize the UI with System Designer. 12) READY FOR THAT GLOBAL DEPLOYMENT. THE WHY: The Polycom RealPresence Touch interface for its RealPresence Group Series and Immersive Telepresence solutions comes complete with a Skype for Business user interface and is part of Polycom’s recently announced Microsoft Skype Room (MSR) Series. The simple and intuitive design is consistent across the Polycom portfolio, whether you’re calling from a conference room or using a Polycom desktop, mobile or web client. The background image can be customized to match branding or provide information about the room. RealPresence Touch is easy to deploy, with PoE for single-cable connections. Get your conversations started easily with one touch dialing from the integrated calendar, right on the home screen. Once in a call you have easy access to share content, adjust camera views, change participant layouts and more to get the most out of your meeting. THE WHY: This new addition to Touch International’s OFM Series touch monitors features an optically bonded, multi-touch projected capacitive (PCAP) touch screen, HD display, powder coated steel frame with versatile mounting options, and can be completely customized for any application. The high-definition 1920×1080 display supports 16.7 million colors with a 3000:1 contrast ratio. HDMI, VGA, and DVI inputs are tucked behind the monitor for simplified integration. Power supply and video cables are included. The OFM Series can be customized with Touch International’s manufacturing options, including sunlight readability, night-vision (NVIS), SBC or media player integration, water resistant and gloved touch, custom cover glass and graphics, touch technology, ruggedization, anti-fingerprint coatings, and more. Nureva’s Span system is an interactive workspace with a modular design. The unique configuration enables groups to visualize information on up to 30’ 2” (9.19 m) of space, and up to 30 simultaneous touch points, making it easy for everyone to engage in sharing ideas and solving problems. Take a virtual tour at www.nureva.com/spansystem. NEC Display and T1V have introduced a set of touchscreen solutions that include an NEC touch-interactive 55-inch, 70-inch or 80-inch display combined with the choice of T1V ThinkHub Base software, which provides two wireless device connections over a LAN network, or ThinkHub Standard software, which provides unlimited wireless device connections over any network in the world. The NEC multi-touch displays offer a commercial-grade build, easy integration and an interactive design that provides users with the ultimate interactive tool. T1V’s ThinkHub is a dynamically configurable workspace. The bundled products represent an industry first: combining a touchscreen produced by a major LCD display manufacturer with interactive collaboration software.